Now you can listen to audiobooks from Audible with Echo. Audiobooks offer a great way to enjoy your favorite books while relaxing, cooking, or spending time together with family. 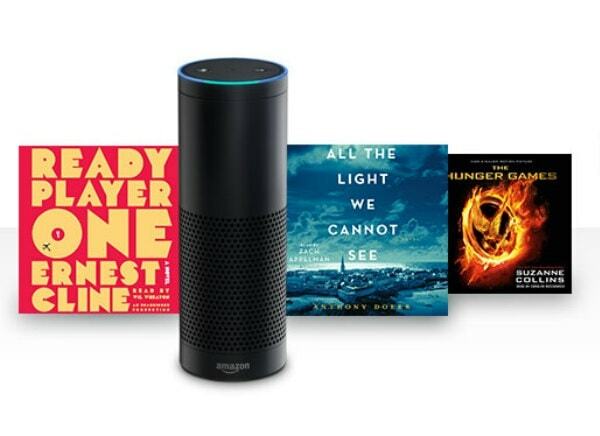 According to another source, Amazon is also marking the occasion by giving away two free audiobooks to Echo owners. That's great news. A lot of readers have been wanting the Echo to support audiobooks and Kindle ebooks ever since it launched last November, and now we're halfway there. And what with the way Amazon has been releasing updates on an almost monthly basis, it shouldn't bee too long until they add support for reading kindle ebooks aloud. I’m not a big audiobook user but I just tried it with one and it worked great. I might become a bigger user with the voice control playback. You’re probably right. It makes more sense that way. They are also offering free extended samples of a bunch of titles. Is that different from the normal offer? I purchased the echo from QVC and it offers two free audio books but the code will not work. I was told I would receive 2 free audio books if I purchased the Amazon echo from QVC. I can’t find it online I only want the free books not a subscription after 30 days. Audible has a standard offer of a free months trial subscription. This would get you the two free audiobooks. I think that is what QVC was talking about, which was not honest of them. I think you were had. I bought 2 echo dots from QVC and received activation instructions eto get 2 free audiobooks from audible and was told by “Amazon Help” that because I am already a subscriber for a long time, that I can not redeem the promotional offer. RIPOFF. good luck to the 50,000+ other buyers who bought that day from QVC. I won’t dump Amazon/Audible (I have over 300), but I sure won’t buy from QVC again. I just want to get my two free books, How can I do that?